Your Southern Quest begins in the morning when you depart for a scenic flight up the Kimberley coast to the Mitchell Plateau. Board a helicopter and enjoy an unforgettable flight over the spectacular Mitchell Falls before landing on the helipad of the Kimberley Quest II, followed by a buffet lunch at anchor. 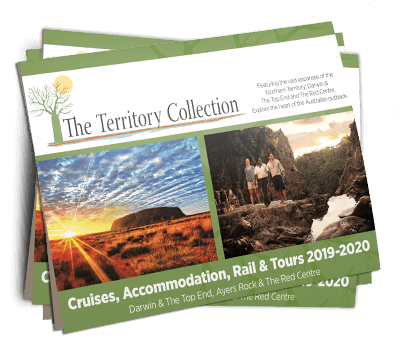 Late afternoon take a scenic tender excursion to view the amazing high red escarpments and wildlife which make the Hunter River so special. This morning we visit Careening Bay, site of an ancient carved boab tree first visited in 1820 by Phillip Parker King while on a hydrographic survey off the Australian coastline. We then cruise through St George Basin, a stunning inland sea. Leaving the vista of mighty Mt Trafalgar and Mt Waterloo, we cruise up the Prince Regent River, marvelling at the pristine waterway that cuts through sandstone cliffs and gorges. Take an excursion to Camp Creek, a beautiful waterway lined with weeping paperbarks where you can enjoy a walk to the top of the falls for a refreshing swim. Early morning we cruise to the King Cascade waterfalls, which are spring fed, to marvel at the rush of water cascading in breathtaking tiers, surrounded by lush ferns and a myriad of wildlife. Climb above the falls for an unforgettable swim in a massive crystal clear pool. Be rewarded with a breathtaking view over the magnificent Prince Regent River in the distance – wilderness adventuring at its best! Late afternoon join our guides for an excursion to Cathedral Falls, while spotting crocodiles and flying foxes. Alternatively fish the Prince Regent River which is renowned for big Barramundi and Threadfin Salmon. At nearby Camden Harbour, we visit forlorn settlers’ graves on Sheep Island and soak up the history of the early European settlement. Take one of the tenders for a spot of exploration, have a go at fishing or collect rock oysters. Alternatively relax on the sundeck to take in the beautiful scenery. We then cruise between Augustus Island and the mainland, passing the remote pearling settlement of Kuri Bay. Late afternoon we visit the mysterious cove at Langii and witness the ‘Petrified Warriors’ – remarkable sandstone pillars which represent the warriors killed in a Dreamtime battle. Afterwards enjoy a swim in the pristine ocean. This morning we cruise to Steep Island and anchor below Raft Point, as we prepare to walk to the caves perched on the hill, where some of the finest well-preserved Wandjina art in the Kimberley can be found. From the top we have an amazing view of the Kimberley coast. We then explore the Sale River and take an excursion upstream for a dip in the spring-fed rainforest pools and on the journey home view ancient rock art from the tenders. As the sun begins to set, we fish the inlets of Doubtful Bay for the elusive Barramundi and Threadfin Salmon. Take a tender excursion to Red Cone Creek for a refreshing swim at Ruby Falls, or join our guides to try your luck at mud crabbing. We then cruise to the amazing Montgomery Reef, which covers more than 300km², making it Australia’s largest inshore reef. Watch as the tide falls right before your eyes, creating a waterfall effect as the reef rises out of the water. Then take a ride in the tenders to observe many marine species, including turtles and sea birds. Late afternoon try your luck at Barramundi fishing in Collier Bay or alternatively relax on board and take in the beautiful scenery. Cruise to Talbot Bay, home to one of the icons of the Kimberley coast, the spectacular Horizontal Waterfalls. Take a tender and head in for an up-close and exhilarating ride through this natural phenomenon. Join a scenic excursion up the back of Cyclone Creek to marvel at the amazing rock formations. Cool off with a refreshing swim in Dugong Bay, followed by a scenic tender excursion. In the afternoon we cross the vast King Sound, cruising through the thousands of islands of the Buccaneer Archipelago. We pass Cape Leveque at sunset and journey through the night towards Broome. Arrive into Broome early morning. Enjoy your last breakfast on board before saying goodbye to the crew of the Kimberley Quest II. Disembarkation is at approximately 8.00am, where a courtesy vehicle will transfer you to your accommodation or the airport.